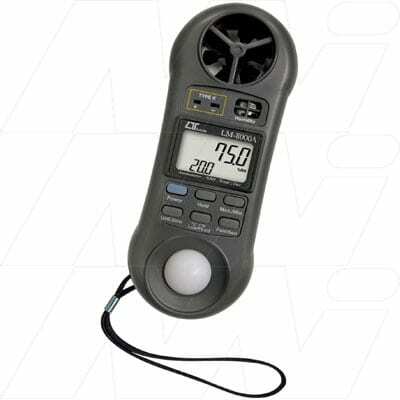 The LM-8000 is a 4 in 1 professional measuring instrument: Anemometer, Hygrometer, Thermometer and Light meter. * Anemometer uses the magnetic sensor structure, Low-friction ball bearing mounted wheel design provides high accuracy at high and low air velocity. * Exclusive photo diode and color correction filter light sensor, spectrum meets C.I.E. photopic. * High precision thin-film capacitance humidity sensor with fast response to the humidity variety. * Standard type K (NiCr-NiAl) thermocouple outlet suitable for all kinds of type K probe. * ℃/℉ selectable by pressing button on the front panel. * Lux/Feet-candle selectable by pressing button on the front panel. * Multi channels display for relative humidity and temperature measured values or air velocity and temperature measured values at the same time. * Zero button design makes light meter calibration.